Hello Spring…on a chilly note; Extended hours beginning Monday! Spring has made her grand entrance and has shown a frigid disposition. At least that was the case this morning. At 5:05 this morning we hit our pre-sunrise low temperature of 25.2 degrees. Ouch! Fortunately, our incredible staff here at Bates, handled the ‘move-in’ rather swiftly, as we carefully protected all of those tender plants from freeze damage. Tonight there is still a chance of near-freezing temperatures here in the Whites Creek valley. Beginning tomorrow, we will begin the move out. The plants are already inside, so we’re not taking any chances by starting that process today. The transition from winter to spring has fascinated folks for generations. That being so much the case, that once Spring has officially arrived, every cold spell that follows, does so with a question: Which winter is this? The answer to that question usually coincides with what are the predominant flowering native trees in bloom. You can safely say that this ‘winter’ is redbud winter. 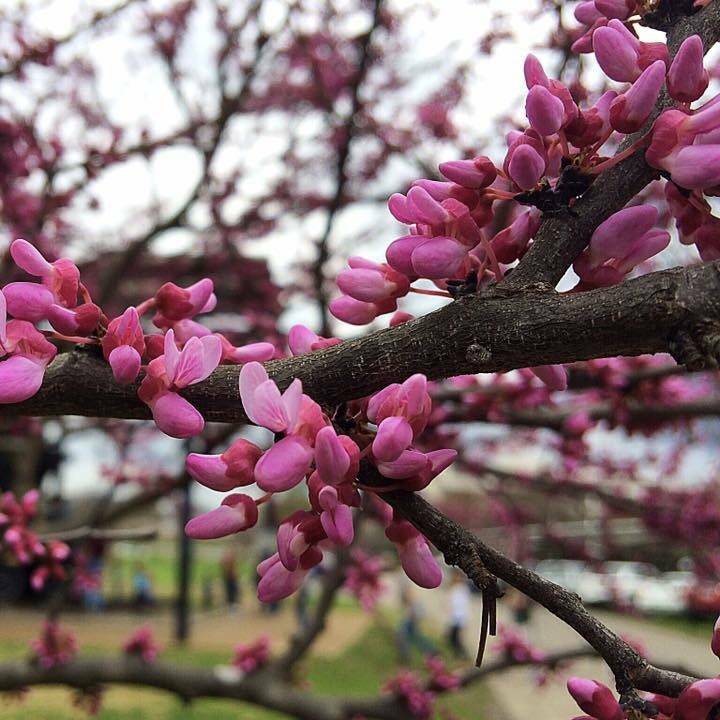 The redbuds are most certainly putting on a show! The next winter in line is dogwood winter. That ‘winter’ normally occurs in mid/late April. After that, locust winter is up, usually around late April/early May. By the time that mid-May arrives it is usually time for blackberry winter. Each of the previous ‘winters’ make sense, though often I hear many people debating which ‘winter’ is currently happening, when flowering times overlap. I always assume it is the later flowering native. Then there’s the most curious ‘winter’ of all. It has nothing to do with anything being in bloom, unless you count bloomers themselves. The fifth ‘winter’ goes by a variety of names, depending on where you come from. Britches winter, or linen britches winter, or cotton britches winter, all refer to the fact that a cold spell has again arrived, when you have already put away your woolen winter clothes… in late May. We’re not thinking winter! We’re saying, “Hello Spring!” Second shipment of early annuals are here. Beginning Monday March 26, we’re open until 6pm!